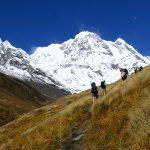 Royal Trek or the annapurna short trek is the best option for trekkers who want to explore trek trails near Annapurna region. Trekkers can experience village life while walking on the scenic trail .Along with this they can views Himalayan mountain enriching overall journey. Furthermore, this trek doesn’t put much pressure on trekkers bodies. It is an easy trek with few up and downhill trails. We highly recommend this trek to those individuals who seek mind-blowing mountain views and indescribable natural beauty. 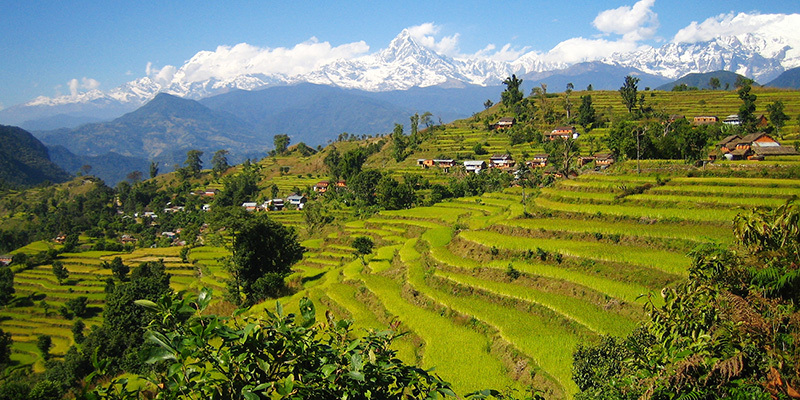 Annapurna short trek starts with a scenic drive to the beautiful lakeside city of Pokhara. Here, you can enjoy a relaxing evening along the edges of Fewa Lake. You can also enjoy the closeup view of Mt. Machapuchare along with other snow peaks. Moving on with our trek, we now have to pass through beautiful Gurung villages which gives us an opportunity to observe rural lifestyle. Besides that, trekkers can even learn about the local communities, their history, and cultures if they wish to. Likewise, you can receive many meaningful cultural experiences from a diverse mix of people and cultures that inhabit this region. In this annapurna royal trek, we are able to enjoy stunning views of the impressively built hillside rice terraces, the magnificent Annapurna range, Machapuchare (Fishtail) and Mt. Langtang. Lastly, our trip ends at the scenic Begnas Lake which is about 30 km west of Pokhara City. Contact Euro-Asia Treks and book our Royal Trek today! After having our early breakfast we drive towards Pokhara. Pokhara is situated 200 km west of Kathmandu, is the most important tourist destination after Kathmandu. This is the entry point for famous Trekking routes to Dhaulagiri, Annapurna and Mustang region. It is a meeting point for nature and culture.Trails for different excursions and hiking are available to suit individual interest and needs. When the weather permits one can enjoy the panoramic view of Annapurna and Dhaulagiri range hardly 25km away from Pokhara. One can enjoy the tranquility and peace while doing boating at Fewa Lake in one hand and see the grand view of the snow clad mountains on the other. After having our instant meal, we drive towards Bijaypur Army Camp. Then we start the trek. Trail initiates in rice fields then ascends through the village of Rakhigaun to Chutara. Climbing gently along a ridge top through few villages of Brahmins & Chhetris we head towards kalikasthan at end of the day. As always we start our trek after having our breakfast. Crossing through various tea houses, today the trail continues along the forested ridge top through Thulokot to Moti Thana. After a short climb we arrive at Naudanda. Continue along the ridge to a school at Lipini Village. We arrive at Gurung village of Syaklung after steep but short climb through forests. After having our breakfast we go for great views of snow capped mountains from Annapurna Himalayan Range to Lamjung Himal, Manaslu and Himchuli. Slowly we head towards Chautara and we head towards Begnas Lake. The Royal trekking trail then ascends towards Chisopani. It is the final day of our Royal Trek. We trek from Chisopani along the ridge and stone steps, visit Begnas and Rupa lake and finally end our trek after heading back towards Pokhara. 4 Days trek as per program with English Speaking Sherpa Guide and porter. 03 Nights Accomodation in Kathmandu with daily breakfast.